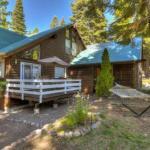 Kimball Dog Friendly Rental is a holiday home situated in Carnelian Bay. Guests staying at this holiday home have access to free WiFi. Opening onto a patio the holiday home consists of 3 bedrooms. The kitchen has an oven. The holiday home offers an outdoor pool. Kimball Dog Friendly Rental provides BBQ facilities. Reno is 40 km from the accommodation while South Lake Tahoe is 34 km away. Reno-Tahoe International Airport is 40 km from the property.